Emus are very tall birds. The average height is about six feet seven inches. Their feathers are short, grey to brown in color with black on the tips. Their heads are covered with black feathers except for those around the eyes which are white. The feathers look shaggy, rather than smooth as in many birds. Emus have very short wings and very long necks and legs. Where Are Emu Bird Found? 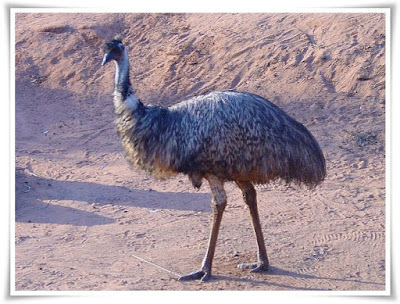 Emus live in Australia and are the largest bird native to that country. What Do Emu Bird Eat? Their diet consists of plants and insects. Where Do Emu Bird Live? Emus live in dense forests and in extremely dry areas. Although they are birds, Emus cannot fly. Emus can run very fast, over thirty miles an hour.